I’ve mentioned in a few of my narratives how I was once a little more active musically than I find myself able to be today and just this past weekend while cleaning around some of my packed away gear I discovered this unexpected surprise. The first and second set list of tunes that was performed by my Ramones tribute band “The Ramoniacs” during one of our gigs. I just had to share it with you and I hope you like it. The Ramoniacs was a three-piece unit that featured Scott Koblish on guitar and vocals, John Conroy on bass and vocals and myself on drums and backing vocals. The initial premise was to do a lot of Ramones for people and as you can see by the pair of nineteen song per set lists that is exactly what we did. To my knowledge there are not any photos of the group in action, but be aware we were not a tribute in the sense where we dressed like them anyway. Scott did bring a wig to one show and we took turns wearing it and for one set at a show I attempted to wear a motorcycle jacket. That was not too easy. We only did about a handful of gigs before parting ways but our set was an interesting one to say the least. It was about 90% Ramones covers from across their entire catalog (with a heavy emphasis on the classics) and the other 10% was used for a few originals and songs we liked and did as if The Ramones had offered them up. We had no official logo or band photograph for gigs and that actually kind of surprises me when I think about it. Like all bands there were some fun times and there were also some harrowing ones. That’s music life for you. I’m still in touch with Scott today thanks to the likes of Facebook and he is currently drawing “O.M.A.C.” for DC Comics. Be sure to check it out. If I find any other stuff about the band in my archeological digs I will be sure to share it with you here. Many thanks to SkeletonPete for taking these two photos and putting them together. The set list was a double sided card. Maybe I should laminate this. One thing I want to share more of whenever possible are the music adventures that fall outside of the stuff I normally do with the PiercingMetal.com site, and this seemed like the perfect place to do it since the blog’s overall premise was to be more in tune with my actual life. That being said, many years ago I was the drummer for a New York City based Heavy Metal band called Machine. The four of us were active on the local scene in the late 80’s and at the start of the 90’s and played numerous gigs including the famous L’Amour in Brooklyn. The band consisted of Jeff Mackey (bass guitar/vocals), Rob Rizzo (lead guitar/vocals), Anthony Trzesinski III (lead guitar) and I (drums) and we managed to do some Metal good while we did this. Perhaps I will reflect upon just how different being in a band was at that time in a future blog post but now the reasoning for this particular one. Even though the band had ended many years ago, we all stayed in touch when it was possible to do so and sadly without going into any personal detail, our guitarist Anthony Trzesinski III would pass away in early January of 2011. It was terrible to lose a former band brother and any musician will tell you that you live a lot of life in the times that you work together in this fashion. Thanks to the planning by one Anthony’s closest friends (Joe Affe of the band Maximum Penalty), a benefit to honor his memory was organized and musicians who he knew were all called upon to help raise a glass in true Rock and Roll fashion. 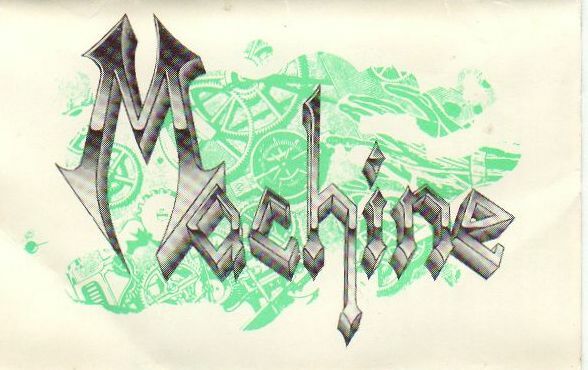 One of the group’s that was tapped for the memorial event would be Machine, a band that had not worked together since 1991. It was going to be interesting to see if this worked at all. Rehearsal studios in Brooklyn are not so common a thing nowadays and I remember when there were at least three in my own neighborhood but that was a long time ago in a music scene far, far away. Joe would secure time at the popular Fastlane Studios which is out in Kings Highway. Everybody would gather there and have a lot to work out in a short time. Behold the entrance to the studio. This was a view that I hadn’t seen in quite some time. The DW 5000 bass drum pedals you see are mine as is the bag of sticks but everything else was property of the studio which was great. Less lugging things around and more time to focus on the task at hand. The carpet was a bit of a mess so the drummer in the space before me definitely spilled something or they just haven’t cleaned it in a forever. Back in Machine times I used a sizable drumkit but for the reunion/benefit event the drummers would be keeping it more compact and I think I was the only one who needed a double kick drum so this pedal would be my resolution. I was nervous of course since it was not something I had kept the chops up on. Here we go. The videos below are from the second session of rehearsals that were done at the Fastlane Studios out in Flatbush. We all hit the space together with the folks in the All-Star Band and we closed out the rehearsal time by giving our Machine material a run through. It was a little choppy at the first session the week before but it seemed that it was workable at the second session we did. The first tune we opted to do from our repertoire was the song “Mechanikill” which was one of our more popular numbers and one largely an ATIII composition. Since we had friends hanging around these sessions, I asked our buddy Ewok to film the Metal blasting with my Sony Cybershot camera. Next up was our signature tune “Misery (Loves Company)”, both songs were sung by Jeff. This was one of our oldest of the creations which I think we had about a dozen of before it all ended. The guys in the studio were all seeming to have a good time as well. Never a bad thing. United once more in Metal for a good reason. As a band Machine loved a lot of the classic players, and one of the bands we enjoyed most was Motorhead and while Jeff might disagree with me, I don’t think that “Iron Fist” was the first tune we played together as a band. I could have sworn it was Black Sabbath’s “War Pigs”. Oh well. Here is our go at “Iron Fist” just the same with guitarist Tommy Falanga who once worked with Jeff in the band Tempest. Tommy and I are actually colleagues on the Heavy Metal Mayhem radio show these days. He’s the co-host and I am the weekly concert calendar reporter and scene guy. Love it. Jeff said that he and Anthony had Motorhead’s “No Class” as their theme song, and I never knew this until these rehearsals. Oh well, we cannot know everything but they were indeed close so I gave him the benefit of the doubt. Personally I had never played this song before these rehearsals and was nervous for this one. I felt it was the longest 2.5 minutes of the sessions. In the end it worked out. 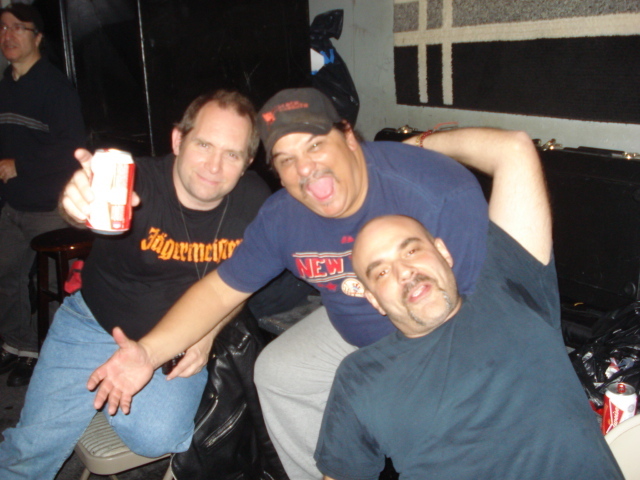 Last but not least here is a silly photo of Jeff, Rizz and I from the rehearsal that preceded the one in these videos. It was a very spontaneous shot and I guess it worked for what it was. I’ll try to blog about the overall benefit affair when time allows me to do so. I hope you enjoy these videos. It was surely interesting to be doing this kind of stuff again that is for sure. I had to say that I missed it just a little bit more than I had expected to. Keep it Metal my friends. I was at rehearsal studio this evening and while some of the guys were blasting out a cover of the classic Ramones song “Rockaway Beach”, me and one of the other guys noticed how a beer can was enjoying himself as well and dancing away to the best of his ability. It was too cool not to share with the readers of the PiercingKen Blog, so please enjoy the smooth style of the Punk Rock Beer Can. I realize this is very silly, but we do that over here from time to time. No beer cans or floor toms were harmed during the capture of this little video. 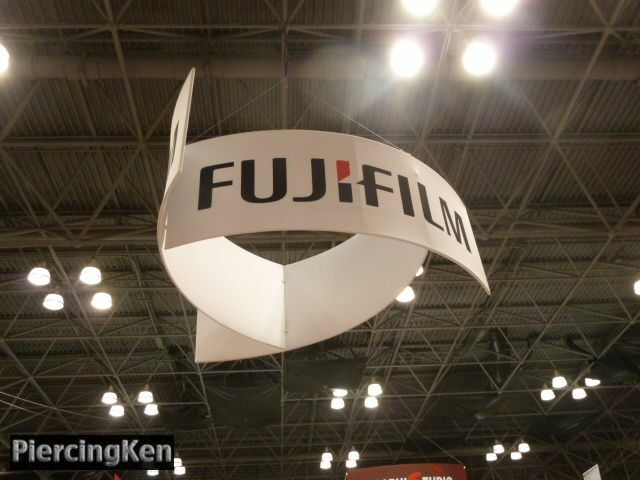 It was almost Halloween and only a few short weeks after the NY Comic Con that I documented HERE over on PiercingMetal and that meant that it was now the PDN Photoplus Expo’s turn to take over the Javits Center. This was my second year attending and I would take this adventure with my good buddy Skeleton Pete. For the most part this post will be one of photos only and I will admit to paying a little bit more attention to some of the models that we chanced upon. So without any further adieu, here we go. It was just about a year ago when I was walking down Broadway on my way to see a publicity rep of note that I discovered a public art display that was really interesting. They called it the Sidewalk Catwalk or something of that nature and it was the kind of thing that made me glad that I almost always carry some kind of camera with me on my NYC wanderings. You truly never know what you are going to see during the course of the day in this amazing city. 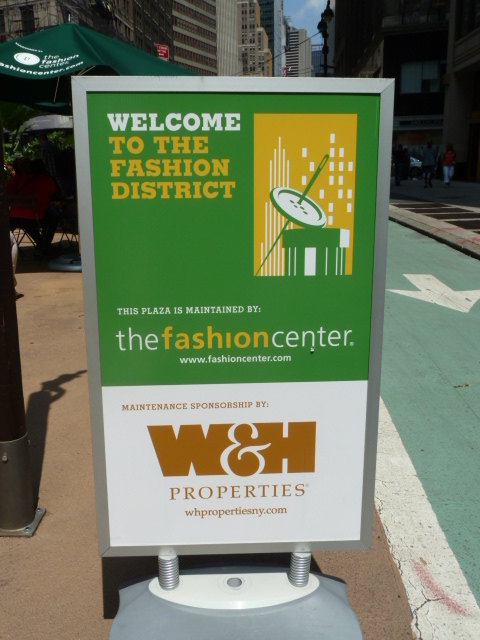 That brings me to this next blog posting, “The Figurations of the Fashion District”. The journey begins here on 36th Street and Broadway. The sign below comes from a few blocks lower of course but I added it here for dramatic effect.